These bicycle lights from FlashBright are great. We love to go out and ride bicycles as a family in the evenings, especially in the summer time. However, sometimes it’s dark before we get back so these bicycle lights really come in handy. This set by FlashBright is really neat it comes with an emergency light that really is great for safety. You want to make sure that if you have an emergency you will be able to be seen. This emergency light is red and has three settings (constant, fast pulse, and slow pulse). It also has a flashlight that you can attach to your bike for a head light. You can use this when you are riding at night to see where you are going as well as be seen. I also love that it is detachable just slide it out of the holder and then it becomes just a flashlight. These both just clamp onto the handle of the bicycle and adjust to any size. Great high quality set. THE BEST LED BIKE LIGHT FOR YOU PERIOD! THE EXTREMELY BRIGHT LED LIGHTS ILLUMINATE YOUR PATH AND IMPROVE YOUR SAFETY BY INCREASING YOUR VISIBILITY TO ANY ONCOMING CARS. OUR FREE BONUS TAIL LIGHT ($14.99 Value) HAS YOUR BACK COVERED AS WELL! 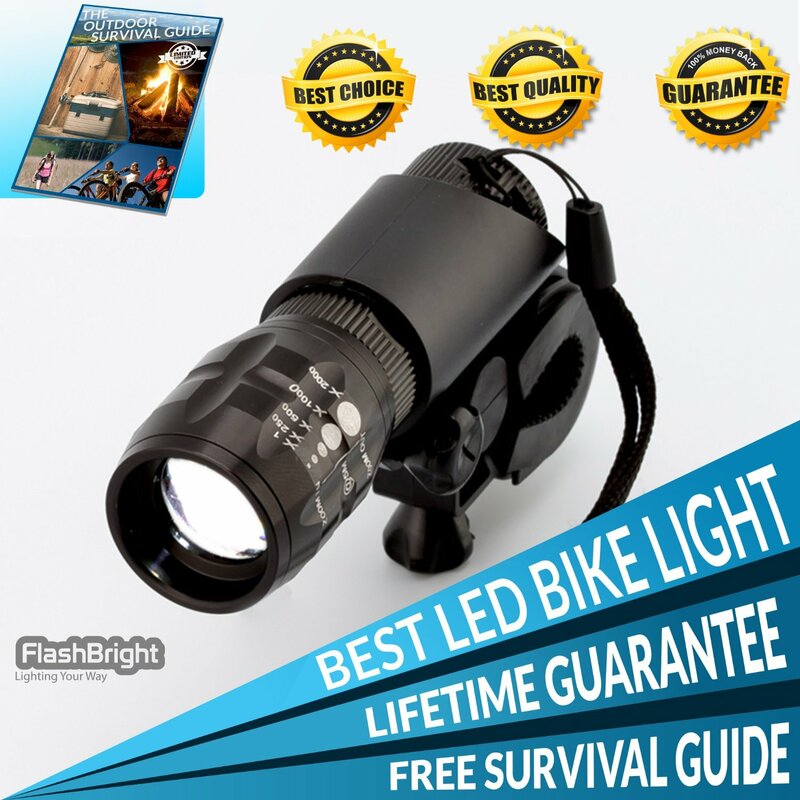 The FlashBright LED Bike Light Shine up to 500 Feet, Has a Zoomable Lens up to 1000x and Comes With a Waterproof Outer Cover Making this Bike Light the Perfect Tool to Have Rain or Shine. QUICK INSTALL IN A FLASH – NO TOOLS REQUIRED – THEFT PROOF FEATURE INCLUDED! Designed to Easily Attach and Detach on Any Bike in Seconds Without Any Tools using Our Quick Release Technology. It Can Even be Used as a FlashLight! It’s so Handy and Ingenious, This is the Perfect Bike Light You can Buy Anywhere! MULTIPLE POWER SETTINGS FOR ANY SITUATION DAY OR NIGHT – RAIN OR SHINE! Three Power Settings, HIGH, LOW & FLASHING Make this TOOL the Most Versatile Bike Light on the Market. Use the Flashing Mode in Daylight to Ensure You Will Be Seen by Any Vehicles in Your Path. NEVER ride blind or without being seen again! Instead of Carrying Flashlight, Quickly Unmount Your Light for Use Anywhere, Anytime, In or Out of the House. Great for Camping, Hiking, Fishing, Walking, Running and Most Importantly Biking! ENSURE THE SAFETY OF YOU AND YOUR FAMILY – AVOID THE UNEXPECTED! Most Statistics Show That the Accidents That Take Place at Night are Due to A lack of a Simple Source of Light. The FlashBright LED Bike Light was Designed to Protect You and Your Kids. HIGHEST QUALITY MILITARY GRADE CONSTRUCTION – Made of the Highest Quality Aluminum and Components This Bright, Waterproof LED Light Shines Up to 500 Feet Lighting Up Your Path Every Time, Rain or Shine. You Will Be Seen and Protected. It’s Critical to Use a Bike Light, Especially at Night. Invest in Your Family’s Safety! OUR QUALITY + OUR GUARANTEES = YOUR SATISFACTION! – 100% SATISFACTION OR YOUR MONEY BACK – We Take Pride in the Quality of Our Products and Services. We are Committed to Providing You With The BEST CHOICE, BEST QUALITY, BEST CUSTOMER SERVICE, FAST SHIPPING and a LIFETIME REPLACEMENT GUARANTEE. ($29.99 Value). For a LIMITED TIME ONLY Besides Receiving the FREE Tail Light ($14.99 Value), You Will Receive Our LIMITED EDITION Outdoor Survival Guide ($12.99 Value) When You Register Your Bike Light For it’s LIFETIME WARRANTY. It’s One of Our Ways to Keep Our Promise of Delivering The Best Service and Meet Our High Quality Standards. We Strive to Provide the Best Customer Service Experience! We Believe Our 100% No Questions asked, No Hassle, Money Back or Replacement Guarantee is the Best in the Business. For More Details See the Product Description Below or Just Order One Now and Consider Getting Another for a Loved One or Your Very Best Friend!